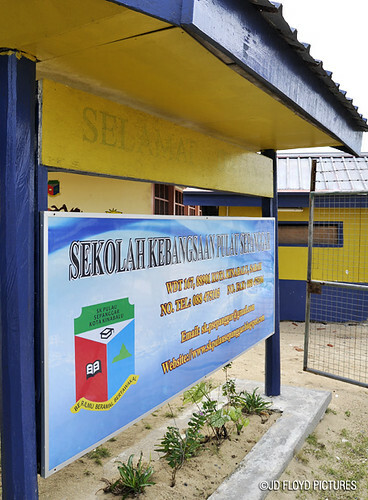 In June last year myself and a group of other enthusiasts visited one of the nearby primary school under government rural electrification project, SK Pulau Sepanggar. The visit was scheduled during school holidays as we would not want to interfere with the school activities. According to its web site, the school is a Grade A rural school with more than 400 students, 25 teachers and 4 non-academic staff. Quite a big number for an organisation located outside the urban boundary. 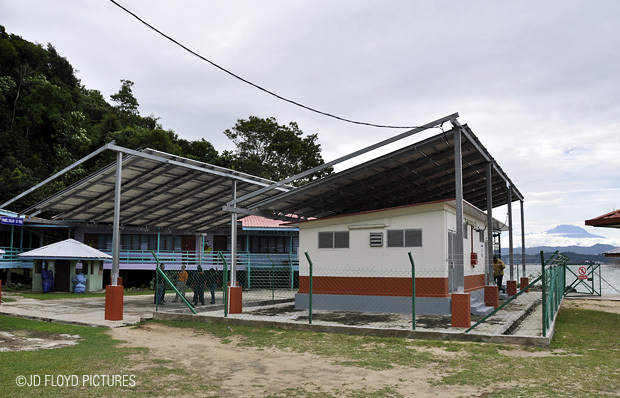 The reason we visited this school is that this is a site of a government funded 25kWp solar photovoltaic installation nearest to Kota Kinabalu. 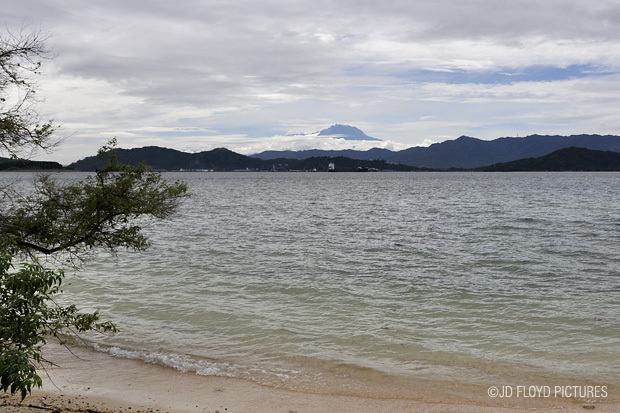 It takes about 25 to 30 minutes to reach there by speed boat. Prior to the visit I had been in touch with Schneider Electric for quite sometime and one of the key areas I am keen to explore is Renewable Energy. With the kind of working environment we are currently in, the two RE initiatives that are likely to be of immediate interest to us are Solar PV and Mini Hydro power. After much examination of the Government incentives on FIT via SEDA, we decided that Solar PV is most appealing and profitable. To start of with, under the Malaysian FIT scheme, the base rate for Solar PV is RM1.40/kWh. 30 minutes of bumpy ride and we have now landed on an island called Pulau Sepanggar. 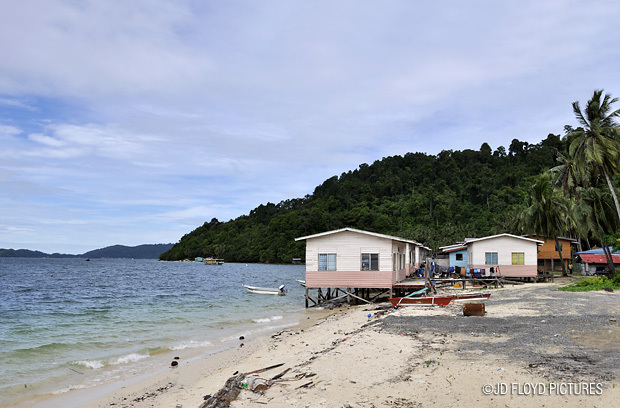 Most houses are built on the seashore. 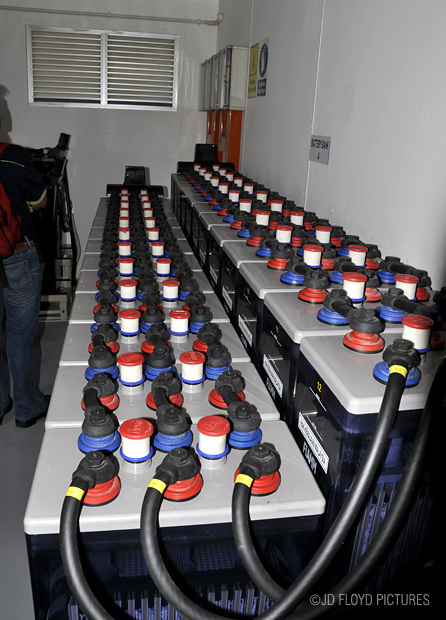 The power supply system here is a hybrid of solar and a diesel generator (genset). The system combines two energy sources and it interchanges the source automatically according to the weather of the day. During daytime and when the weather is fine, power is supplied solely by the solar modules, including recharging of the storage battery. 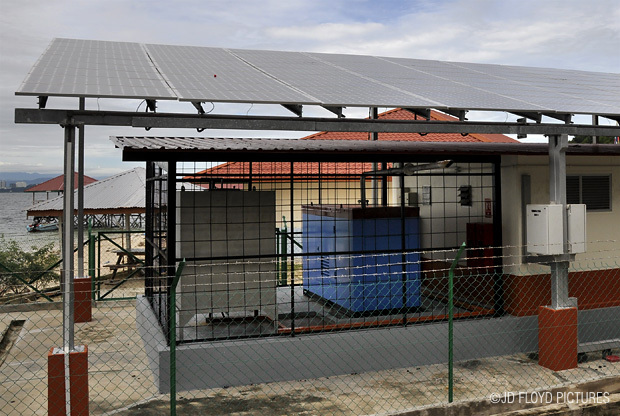 For the installation at SK Pulau Sepanggar, the battery is designed to sustain supply of power for a continuous 3 days without having to start the stand-by Genset on. In the worst case scenario that it continues to rain or overcast for longer period, the Genset will kick in and take over the job of the solar modules, including recharging of battery. Battery maker: FIAMM, deep cycle. Made in Czech Republic. 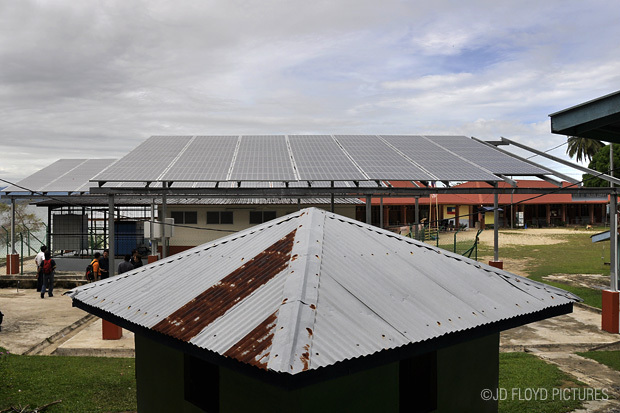 The 25kWp solar hybrid installation; constructed within the school compound. 40kVA Diesel generator acts as standby power supply, kicking in only when solar modules are unable to supply enough, and storage battery runs out of juice. Nothing to do with the Solar PV system here but it probably adds greenery to an already eco-friendly initiative on the island. In any case, this should make great sunrise shots. The installation on the island was funded by the Government and we understand it was costly. For a private entity to embark on such initiative would not make business sense just yet as currently solar panels and storage battery are still very expensive. But with the FIT framework just put in place last year, it is very interesting to find out if investing in a larger system can generate ROI sooner than expected. For our initiative back home, it is possible to install a solar PV with a capacity of between 700kWp to 800kWp at each site. lucky you to be on the cutting edge of new technology! i have a daughter in her 3rd yr of college studying engineering...maybe she will someday help our planet!! as you know we Malaysian never have this culture of maintenance nailed into our head somehow or rather we always forget to put in the budget for routine maintenance. The biggest downside seems to be the cost. It is less intrusive than most power plants and detracts very little from the breathtakingly beautiful landscape. Inspiring post! @momto8. A noble intention indeed. I wish your daughter a successful study. @thomas. Unfortunately that's what happen in many government initiatives. A stark difference from what the private entities are doing. @smilla4blogs. The cost is high but with technological advancement, it is going down rapidly and at some point (hopefully not too far away from now) the cost of generating electricity from solar PV will come to parity with the those of conventional methods. Diesel mechanic provide the tips for maintaining and repairing your vehicle. So, please recommend me experienced diesel mechanic. That Solio charger looks like it could also be a miniature wind turbine. I wonder if it would make sense to combine small turbines and solar panels as they are complimentary sources of intermittent energy.